Got Cow? 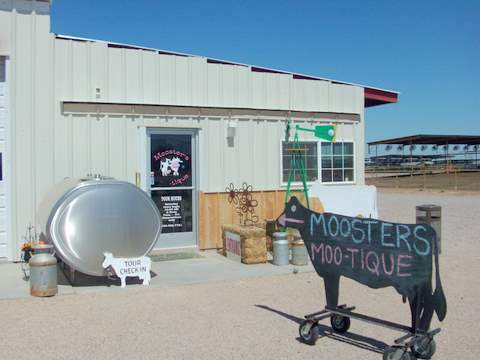 The Superstition Farm is a working dairy that you can tour. Got Cow? The Superstition Farm is a cheery place that will uplift you with sunshine, happy animals and friendly people. 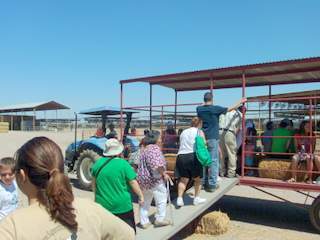 The Superstition Farm is a dairy that you can visit on Saturdays and see an informational talk about dairy cows, feed some farm animals, and take a guided hay wagon tour. If you are a city slicker like me you might have some concerns. You might wonder if there is going to be a blue methane haze that will make your nose smart. Maybe you will have to keep your mouth closed to keep out the flies? Well nothing could be farther from reality. This is an exceptionally clean and surprisingly low odor agritourism facility. Buy your ticket at the “Mooster’s Moo-Tique” where you can get gifts and some food items like eggs, butter and cheese. And get this; most of the animals are incredibly tame. You will smile when you see a small child pick up and hold a chicken like it was a kitty cat! “Cow Tales” in the Superstition Farm house. The next stop is the barn where they have seats made out of bales of hay. You file in and find a place to sit. Then one of the presenters talks about the dairy business and how you get milk. It’s just like “show and tell” when you were a kid in school. And way more fun. Anyway, the class goes on for an hour or so and you get to see some interesting things. Like the buckets of cow feed. 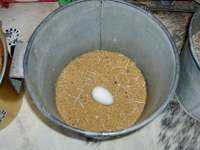 Cows eat different things that are cast off from other processes like the leftovers from spaghetti, fluffy cotton seeds, and stuff like the leftovers from fermentation. Kids say funny things. You will have the time of your life watching children! The presenter asked us “what is the difference between the brown (Jersey) cows and the black and white (Holstein) cows.” A little darlin’ up front said the “brown cows give us chocolate milk.” I’m not making this stuff up. Anyway, after some chuckles, the presenter said that brown cows produce more milk fat which is better for products like ice cream, butter, etc. The Stechnij's Superstition Farm has over 1,000 cows, with a ratio of about 100 cows to 1 bull. Bulls are there so they can get more cows. And guess what? There was a brand new calf just born in the maternity ward of the farm. It could barely stand up. Here's a movie of some of the curious cows. Then when you are done with the classroom you get to go on the tour. File into this hay wagon and you get a guided tour. Here’s a picture of the huge feed bins that make up the food mix. Ever wonder how cows handle the high heat of Arizona? Same as people. They drink a lot of water. This modern dairy has several ways to keep the cattle from overheating. They have shade areas and computerized water mister fans. Misters work great in the dry Arizona air. The care of the animals must pay off because their cows produce more milk by far than average dairies. The tour guide said the average cow milk production in the states is less than 10 gallons a day but these cows can produce in the teens. Is it because of the great care? Is it because of the nice weather 9 months a year? You will drive by the different areas where they keep the cows. Ever wonder how safe your milk is? They have a vet that checks up on them all the time. And a special area for cows with colds etc. They get medicine just like people. You get to see the pill injector tool and these huge pills that look about the size of your thumb. When you are done with the tour you can get a glass of flavored milk for a dollar. They serve chocolate milk, peaches and cream flavored milk, and about ten other flavors. It really is refreshing and a nice way to end your tour.